The HP Smart Array P822 is HP 's 24 port Serial Attached SCSI (SAS) RAID controller with PCI-e 3.0. 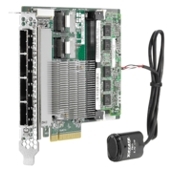 This high performance SAS RAID controller provides high levels of reliability for HP servers through its support of 6 Gb/s SAS and 6 Gb/s SATA technology, 2 GB FBWC, and advanced RAID capabilities. This controller ships standard with a Smart Array Advanced Pack 2.0 license key and supports up to 227 Hard Drives.